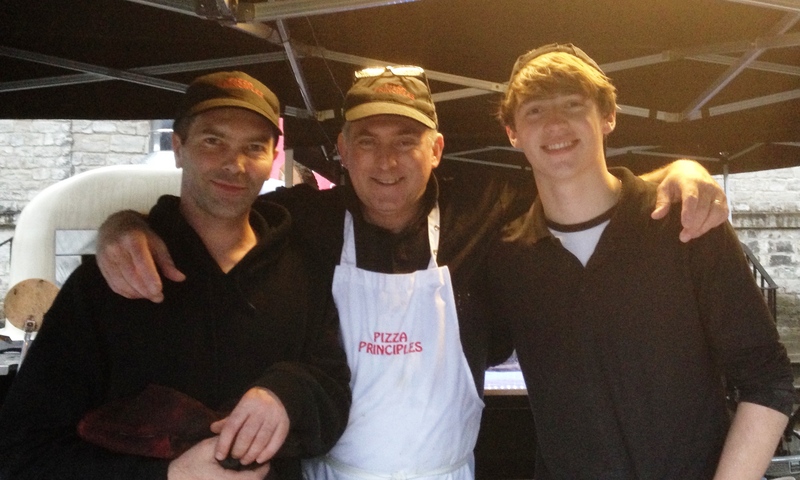 The team at Pizza Principles are pizza lovers but they have to be traditional hand-stretched Neapolitan wood fired pizzas, fire-tickled in a traditional Italian wood fired oven. We are based in Bollington, Macclesfield, Cheshire. We travelled the globe via Boulder Colorado to realise our dreams of fire-tickling the most delicious, dreamy authentic Neapolitan pizzas this side of Naples. We make traditional pizza for the most discerning and demanding pizza lovers across the North-West and Wales. Adopting the principles applied over hundreds of years by the very best Neapolitan Pizzaiolos. We only use the finest Italian ’00’ flour for our pizza dough balls. These are made 24hrs before a booked event. We then hand stretch, (never roll), before topping with crushed DOP San Marzano tomatoes and 100% Italian Mozzarella. Then finally firing them in our genuine, large Italian wood fired oven. We cater for the best celebration parties ranging from 30 guests up to 700. If you demand the very finest Neapolitan pizzas, then Pizza Principles are for you. A Pizza Principles pizza, is a life affirming slice of oozing deliciousness that brings joy to the heart and comfort to the soul. Don’t take our word for it, just click here for client testimonials all of whom are available for consultation. 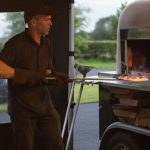 From our specially commissioned 5* FSA rated wood fired kitchen on the Bollington/Pott Shrigley border, we regularly hold wood fired cookery events. These attract people who are equally passionate about great Italian wood fired cuisine. People who wish to learn new skills in the management of their oven and the preparation and firing, of delicious food for their family and friends. Do drop us a line to register your interest in forthcoming classes, or just come see us at our kitchen to check us out. A great present for your fire-tickling partner! Pizza Principles are available to hire for wedding catering (full menu or pizza), celebration events from birthdays, graduations, proms and engagements to large scale corporate event promotional catering. Staff reward and recognition events and film set/location catering. We also cater for local events in support of community and charitable causes, in our commitment to recognising the people and organisations that make a difference! From the grandest castles, the smartest hotels & manors, the country barn settings, to that unique celebration on a beach, in a meadow, up a mountain or in your garden or driveway. Pizza Principles wood fired ‘cucina’, can operate fully independently and ‘off grid’. With eco self-generating pumped hot water from the oven, to 12 volt inbuilt lighting and of course olive wood fuelling, we can go pretty much anywhere! Check out our ‘Trusted Partner’ pages to find venues and suppliers from tipis to photographers that we have met, worked with and can confidently recommend. My love for Pizza began in my early teens, travelling with my family on holidays across Europe where I first tasted the famous peasant food of Italy and it continues to this day. And so it was that in an Italian restaurant in Aberdeen of all places on a cold early spring evening in 2013, I sat down next to the owner of the global logistics company that employed me, ‘Tony this isn’t working for me and I need to leave’……. It was the beginning of a long evening. Back at my desk the following day, I drafted up a resignation letter, dated, signed it and then pinged it to Tony. That was it and the detailed planning for my new life, one that I had dreamed about for years could actually begin in earnest. The road from employment to self employed as a Pizzaiola was underway and now I needed to tell my wife and family! The new journey could begin. So it was that I started out on my journey with the aim and ambition to bring the passion and love demonstrated in the pizza that I had eaten in Europe to pizza lovers in the UK. It’s in our name and it’s why Pizza Principles first and foremost came about. The 18 months from leaving work to starting fire-tickling were rejuvenating and a little crazy, I travelled around 20,000 miles in pursuit of the very best eating experiences; from the green green grass of Ireland’s west, the grandeur of Italy’s renaissance cities and rustic villages, the length and breadth of the UK visiting artisan food markets to the mid west and east coast of the USA to learn from the experts and to see how I could deliver a truly special food. That was then and this is now… four years in and we offer gorgeous, delicious wood fired pizza and the tastiest olive wood smoke infused Mediterranean entrées. Like everyone at Pizza Principles Sean shares a love of great traditional neapolitan style pizza….no ‘deep pan’ or ‘Chicago style’ nonsense for this skilled pizzaiola; just thin crust, with a leopard spotted cornicione/crust and with an ability to fold to eat is his thing! Crisp, slightly chewy and a delicious melt in the mouth explosion of taste does it for this fellow. With a career in catering and a passion for travel, Sean has travelled the world in search of the perfect Pizza and brings what he’s learned to preparing the most delicious pizza you will eat this side of Naples. He’s not the most talkative guy on the team….he takes his passion way too seriously and we sometimes think he needs to get out more but give him a ball of the best pizza dough and his true passion comes out. Add a fire and he is in para….para…..paradise! Hence the ‘Woodsman’. In late 2013 Sean went out to Boulder Colorado to learn the art of working a mobile wood pizza oven and producing true authentic neapolitan wood fired pizza and it was here he truly fell in love. Unfortunately US customs were not keen on him flying back to the UK with a 10 inch Pizza Bianca Fresca so he’s spent months reinventing ‘his love’ back here in Bollington to share with the good people of Cheshire. You probably recognise Reuben from the television, the snow boarding schools of Nagano, Japan or perhaps even the stage and television, as he has appeared in a number of productions; Nicholas Nickleby, Jamaica Inn, Great Expectations to name a few. This guy doesn’t get out of bed for any old rubbish…only the classics and he applies the same principles to his Pizza eating! Not only that but he’s a singer/songwriter too. 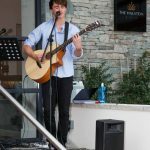 Ask nicely and he may bash a few classics out after firing your Pizza…..or even pen a song especially for you at your celebration party! Eccentric, crazy or just plain odd….some of the views of friends and family. You can draw your own conclusions but it’s for his pizza skills and his sheer entertainment value that he’s with Pizza Principles. We’ve witnessed Reuben grow in the Pizza Principles team and the operation just wouldn’t be the same without him. Hugely talented in all areas this fella can eat Pizza all day long and still want more.